The Belgium international had been expected to slot straight in after arriving from Chelsea for a reported €39million, but the position remains up for grabs ahead of the club's LaLiga opener against Getafe on Sunday. "There isn't a magic formula. We need to manage it week by week," the Los Blancos boss said. "We will see as we go who is best for the team at any given time. We have two magnificent goalkeepers, and others as well. 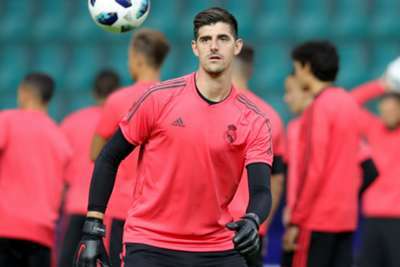 "But of course these are two international-level keepers and we will try to manage it well and make decisions for the team. "Of course there is huge competition for the team but I see it as something positive in that position. It's good for the team to have competition." "We are convinced and we trust in the talent we have to work for the team together," he said. "They have a fantastic attitude. I am sure that we will see a talented Real Madrid with a good mentality, as that's what we all want. "The important thing is the players that are here. The ones that aren't here, aren't important."